The old NES version of Punch-Out has a small Easter Egg for opponents Bald Bull and Piston Honda. If you time your punch just right, you can knock them out in one hit. How? Well, the punch has to be cued to the nod of a certain bearded fellow in the crowd. There's a video demonstrating how the bearded man and the counter-punch works, which you can check out below. IGN picked up the story after it got pretty big on Reddit following a post from user midwesternhousewives. As noted in the video, when the highlighted bearded man ducks or nods, throw the punch and you can instantly knock out Piston Honda. The nod from the bearded man can also work in Punch-Out! when fighting Bald Bull. In the Reddit thread there's someone who confirms that the tactic works after they tried it on an NES emulator. The user repeatedly saved and reloaded the state to test if the reaction from the bearded man always resulted in Piston Hondo and Bald Bull being knocked after getting hit. The user confirmed that this tactic never actually fails, at least for these two fighters. The bearded man is highlighted in the video above and you can see him outlined in the image below. On Reddit they dubbed the bearded man “One Punch Man” because during the fights with Piston Hondo and Bald Bull, when he nods/ducks and you throw a punch, the opponents will be instantly knocked out. 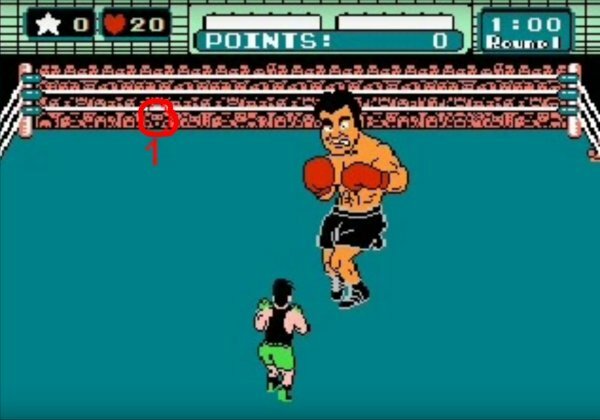 Users tried looking for cues from the bearded man during other fights in Punch-Out!, but it was noted that the pixelated crowd member doesn't flinch during the other fights. Some people decided to look for other cues during the Mike Tyson fights or other characters who were actually tough to beat. The funny part about it is that, when trying to rely on the bearded man for the cue, it was noted that players had a harder time trying to pay attention to the crowd and time their punches in Punch-Out! as opposed to just normally dodging the punches and knocking out Bald Bull or Piston Honda. It may be an Easter Egg but no one said it was tactically practical. It also makes you wonder if there any new Easter Eggs similar to this in the Super Punch-Out or Punch-Out!! on the Wii. I guess 20 years from now someone will discover some out-of-place polygon or crowd reaction in the newer Punch-Out games and whatever popular social media service exists at that point will blowup in activity as gamers crowd around to marvel at the discovery.